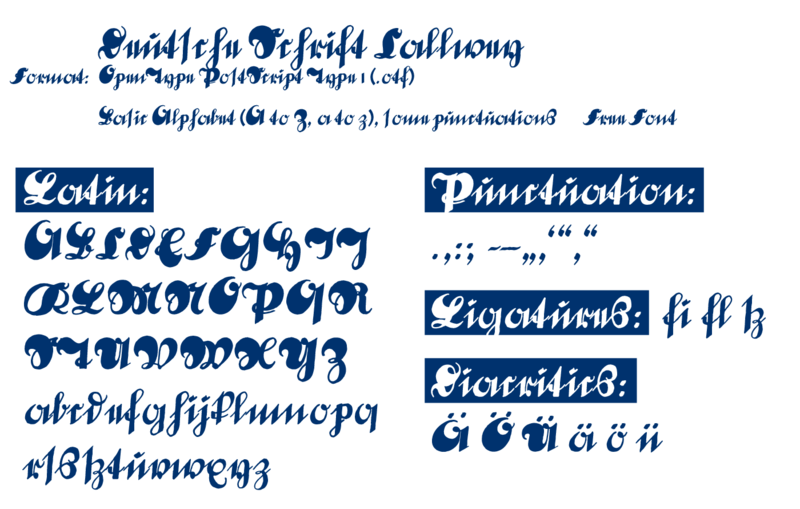 So-called German handwriting or Deutsche Schreibschrift (Sütterlin); capital letters are strongly emphasized; decorative effect, difficult to read. Taken from a script sample from around 1920/30, Karl Schäffer. This script appears on a page of a portfolio of script samples from the Callwey publishing company from the 1920s or 30s where it is labeled "Deutsche Schrift." DEUTSCHE SCHRIFT is handwriting, that is, its letters are joined together by means of cursive writing. Clearly, when adapting to printed type these connections present a problem since they can turn out differently depending on the combination of letters. For the sake of a digitalization most true to the original, the letters have been left the way they appear on the script sample. Thus, transitions which might possibly be somewhat bumpy have to be tolerated or compensated for later. Die sogenannte DEUTSCHE SCHRIFT ist eine im 19. Jahrhundert entstandene Schreibschrift, die später auch als allgemeinverbindliche Handschrift in den Schulen gelehrt wurde. Nach ihrem Erfinder trägt sie auch den Namen „Sütterlinschrift“. Sie war bis zur Ablösung durch die „Lateinische Schreibschrift“ in den 50er Jahren die an den deutschen Grundschulen gelehrte Schrift. Ihre streng reglementierten Formen liessen nur sehr wenig persönlichen Ausdruck zu. The so-called DEUTSCHE SCHRIFT is a handwritten script which came into existence in the 19th century and was later taught in school as the generally mandatory style of handwriting. The script is named "Sütterlinschrift" after its creator. It was the style of handwriting taught in German elementary schools up until the 1950s when it was replaced with "Latin handwriting." Its severely regimented forms allow very little room for personal expression. The present version of DEUTSCHE SCHREIBSCHRIFT attempts to make up for lack of expression by placing exaggerated emphasis on the capital letters. 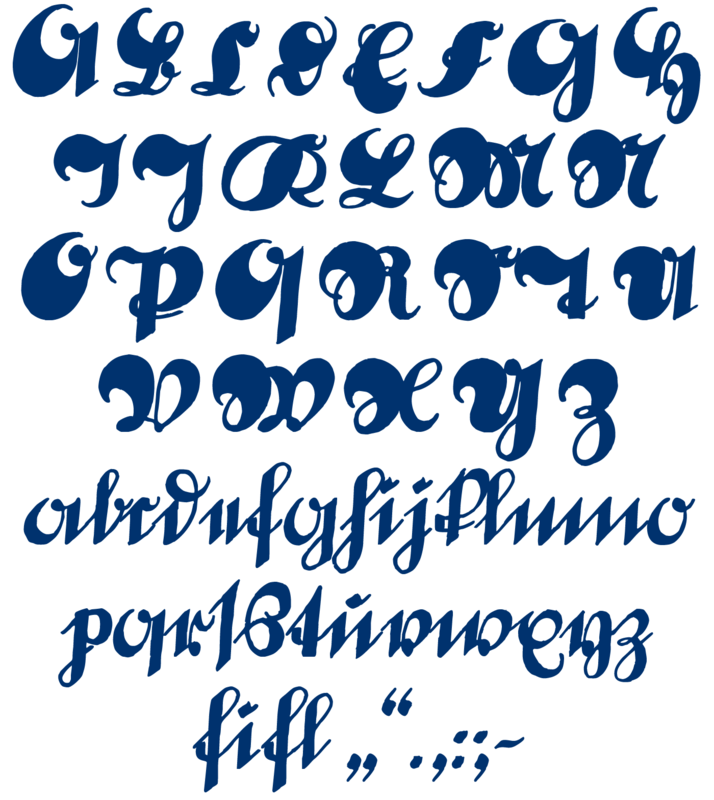 By these means the font obtains a very ornamental character. And since this font is based on a handwritten original, the typical irregularities of the unsteady hand have been retained. DEUTSCHE SCHRIFT has nearly become illegible today. It can only be employed as an antique decoration.